By the time Carl Perkins signed to Sam Phillips’ Sun Records in 1954, he had already been a professional musician for eight years. His career began in 1946, when Carl Perkins was fourteen, and still living in Tiptonville, Tennessee, where his parents worked as sharecroppers. Life was tough for Buck and Louise Perkins, who spent twelve to fourteen hours each day toiling in the fields. Despite working such long days, the Perkins family lived in poverty. To try to make life easier for his family, six-year-old Carl Perkins joined his parents in the cotton fields during the school holidays. After the first day, he knew how hard his parents worked for so little. Carl Perkins was exhausted and his reward for a day in the cotton fields was just fifty cents, which he gave to his parents. After that, Carl Perkins spent every school holiday in the cotton fields, working from dawn to dusk dawn. By the time he was a teenager, he promised himself that he one day, sooner, rather than later, he would escape from the grinding poverty of life in the cotton fields. Offering Carl Perkins an escape from poverty was music. The young Carl Perkins was introduced to music by the Grand Ole Opry, which he heard on his father’s radio. Carl Perkins listened intently to the music, and one night, asked his father if he could have a guitar? With money tight, there was no way the Perkins family could afford a guitar, so Carl Perkins had to make do with a homemade guitar which his father made out of a cigar box and broomstick. This was enough to get Carl Perkins started, and allow him to learn the basics of the guitar. Later, Buck Perkins bought a Gene Autry model guitar from a neighbour who had fallen on hard times. They were grateful for the couple of dollars that Buck Owens gave him for the old guitar. Carl Perkins didn’t care that the guitar had seen better days, at last, he had his first real guitar. Not long after this, Carl Perkins met John Westbrook, an African-American field worker who he called Uncle John. He took Carl Perkins under his wing, and taught him blues and gospel. Uncle John was a good teacher, and Carl Perkins was a willing pupil, who came on leaps and bounds. Around this time, Carl Perkins was asked to join the Lake County Fourth Grade Marching Band. There was a problem though, the Perkins family couldn’t afford the uniform. Fortunately, Lee McCutcheon the lady who organised the Band gave Carl Perkins the uniform he needed, and he joined the Lake County Fourth Grade Marching Band. In late 1946, Carl Perkins and his brother Jay made their professional debut at the Cotton Boll tavern on Highway 45, which was twelve miles south of Jackson. At first, the Perkins brothers played on Wednesday night, but soon, they were playing further afield at the Sand Ditch tavern, which is near the western boundary of Jackson. Both taverns had reputations as places where trouble could break out all of a sudden, but the Perkins brothers proved a popular draw. As 1947 dawned, the Perkins family were on the move. They left Lake County, Tennessee and settled in Madison County, Tennessee. Over the next couple of years, Carl and Jay Perkins continued to play further afield. They were a popular draw, but Carl Perkins felt their sound was incomplete. What he felt he needed was a bassist, and Carl Perkins recruited his brother Clayton on standup bass. At last, the band was complete and went from strength to strength. By the late forties, Carl Perkins was playing on WTJS, which was the local radio station in Jackson. This lead to an appearance on another radio program, Hayloft Frolic, where Carl Perkins played a couple of songs, including Talking Blues. Sometimes, Carl Perkins took to the stage with the Tennessee Ramblers, which augmented his income. Still, though, he was only a part-time musician and worked during the day in various jobs, including the cotton fields. However, what Carl Perkins wanted was to become a full-time professional musician. This came about not long after his marriage to Valda Crider in 1953. By then, Carl Perkins was working in bakery, and one day, he was told that his hours were being cut and he would be working part-time. When Valda heard this, she encouraged Carl Perkins to start playing the taverns on a full-time basis. This was the encouragement that Carl Perkins needed, and he embarked upon his career as a professional musician. A turning point for Carl Perkins was hearing Elvis Presley, Scotty Moore and Bill Black’s newly released Blue Moon of Kentucky in July 1954. Upon hearing the song, Carl Perkins told Valda: “there’s a man in Memphis who understands what we’re doing. I need to go see him.” Not only did Carl Perkins journey to Memphis, but this resulted in auditioning for Sam Phillips’ Sun Records. Movie Magg wasn’t Carl Perkins’ most successful single, the B-Side Turn Around gave him a regional hit single. So did Gone Gone Gone in October 1955. However, around this time, Carl Perkins wrote one of the most famous songs in music. This was Blue Suede Shoes, which Carl Perkins wrote in autumn 1955. When he completed the song, which was recorded on December ’19th’ 1955. Little did Carl Perkins know that it would change his life forevermore. When January Blue Suede Shoes was released on January the ‘1st’ 1956, it gave Carl Perkins the biggest hit of his career. It reached number one on the US Billboard Country charts, two on the US Billboard 100 and three on the US R&B charts. For Carl Perkins this was a game-changer. It should’ve been, but disaster struck after a show in Norfolk, Virginia on March ’21st’ 1956. The Perkins Brothers Band was heading for New York, where they were due to appear on Perry Como’s NBC-TV show the following day. However, the car that The Perkins Brothers Band was travelling in hit the back of a pickup truck, and landed int a ditch containing about a foot of water. Carl Perkins was lying facedown in the water until his drummer WS Holland rescued him. Carl Perkins had fractured three vertebrae in his neck, a broken collar-bone, and lacerations all over his body and lay unconscious for a day. His brother Jay Perkins fractured his neck and suffered various internal injuries, and never fully recovered, and died two years later in 1958. Sadly, the driver of the pickup truck was declared dead at the scene of the accident. March ’21st’ 1956 was a day that Carl Perkins would never forget. It was only later that Carl Perkins discovered, that Sam Phillips was going to present with gold disc for Blue Suede Shoes Perry Como’s NBC-TV show. Blue Suede Shoes had sold over 500,000 copies and transformed Carl Perkins’ career. On April ‘21st’ 1956, Carl Perkins returned to recording and touring. Boppin’ The Blues was released in May 1956, and reached number seven on the US Billboard Country charts, seventy on the US Billboard 100. Later in 1956, Boppin’ The Blues joined Blue Suede Shoes on Carl Perkins debut album, Dance Album Of… Carl Perkins. This was the first of two albums Carl Perkins released during 1956. Carl Perkins’ next single was Dixie Fried, which was released in August 1956, and reached number ten in the US Billboard Country charts. Dixie Fried was the third hit single Carl Perkins had enjoyed during 1956, and as 1957 dawned, the future looked bright for the twenty-five year old. Sadly, Carl Perkins was unable to replicate the success of 1956, and he only enjoyed one hit single during 1957, Your True Love. It reached number thirteen in the US Billboard Country charts, and took Carl Perkins number of hits to four. Carl Perkins was hoping he would enjoy a change of fortune during 1958. On January ‘25th’ 1958 Carl Perkins signed to Columbia Records, after spending three years on Sam Phillips’ Sun Records. 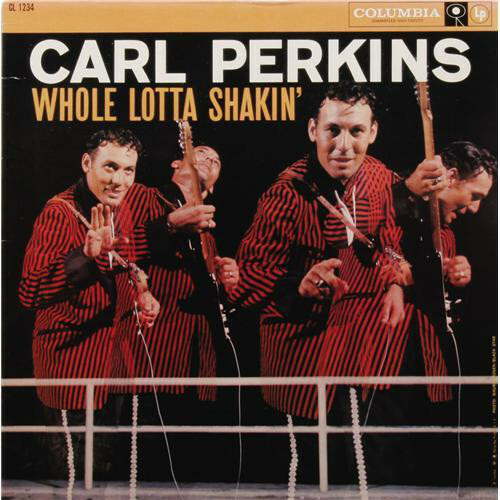 It was the start of a new era for Carl Perkins, who in June 1958, recorded his Columbia Records’ debut Whole Lotta Shakin, which joins King Of Rock, Greatest Hits and On Top on a two CD set recently remastered and rereleased by BGO Records. which joined the country blues of Sittin’ On Top Of The World. It was joined by Ready Teddy, Long Tall Sally, That’s All Right, Where The Rio De Rosa Flows, Good Rockin’ Tonight, I Got A Woman, Hey Good Lookin’ and Jenny Jenny. These tracks became Whole Lotta Shakin’, which was recorded during two days in June 1958. When Carl Perkins joined his band entered the studio in early June 1958, he was sporting a new Fender Stratocaster, which he intended to play on Whole Lotta Shakin’. As the tapes ran, Carl Perkins and his new Fender Stratocaster became one, as he and his band recorded the ten tracks that became Whole Lotta Shakin’ over a two-day period. After that, Carl Perkins found time to record another four tracks which Sun Records would later release as singles. With Whole Lotta Shakin’ complete, the album was sent to Columbia, who scheduled a release date for the autumn of 1958. That was when record buyers would hear what was one of the greatest albums Carl Perkins would record. Whole Lotta Shakin’ features some of the truest rock ’n’ roll ever committed to vinyl. It’s essentially a rock ’n’ roil masterclass from twenty-six year old Carl Perkins. Proof of that is Whole Lotta Shakin’, Tutti Frutti, Shake Rattle And Roll, That’s All Right and I Gotta Woman. Critics upon hearing the album thought that Whole Lotta Shakin’ marked a coming of age for Carl Perkins who was about to step out of Elvis Presley’s shadow. Whole Lotta Shakin’ critics thought, would be Carl Perkins’ biggest selling album. When Whole Lotta Shakin’ was released in the autumn of 1958, incredibly, the album failed to even trouble the lower reaches of the charts. Record buyers missed out on a future rock ’n’ roll classic. For Carl Perkins the commercial failure of Whole Lotta Shakin’ must have been hugely frustrating, given the quality of music on the album. Carl Perkins’ fortunes improved later in 1958, when he released Pink Pedal Pushers as a single. It reached seventeen on the US Billboard Country charts and ninety-one on the US Billboard 100. Little did he know this was the last hit single he would enjoy until 1966. By then, Carl Perkins had visited Britain in 1964 sharing a bill with Chuck Berry, Carl had been greeted with cries of “King Of Rock”. After one London show, his agent Don Arden told him four friends wanted to see him. When he opened the door, Carl Perkins was greeted by The Beatles, who took him to a recording studio, where the Fab Four recorded Matchbox. When it was released in America, the Carl Perkins composition reached number one. The Beatles were just the latest band to cover Carl Perkins’ songs. By then, everyone from The Beatles and Elvis Presley, Johnny Cash, June Carter, Nancy Sinatra, Lee Hazelwood had covered Carl Perkins compositions. This provided him with a steady income stream, given the hits had dried-up. This changed in 1966 when Country Boy’s Dream reached twenty-two on the US Billboard Country charts. It looked as if Carl Perkins was back. The following year, Shine, Shine, Shine reached forty on the US Billboard Country charts. Although it was only a minor hit, Carl Perkins was back where he belonged, in the charts. 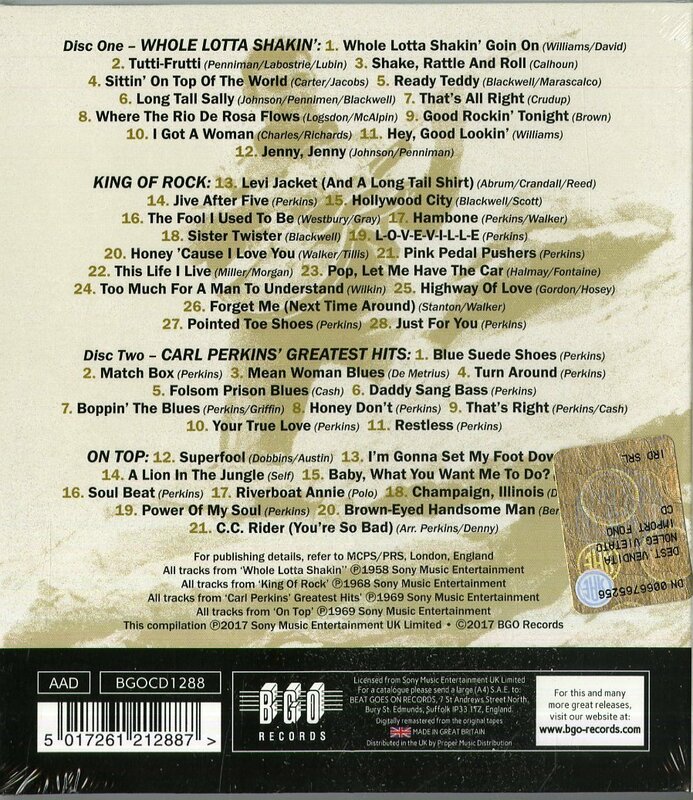 After enjoying two hits in two years, 1968 seemed the perfect time for CBS to release King Of Rock, a sixteen track compilation. It was compiled by David Howells and featured several singles and B-Sides. This included hits like 1958 hit Pink Pedal Pushers and the B-Side Jive After Five and 1959s Pointed Toe Shoes and the flip-side Highway Of Love. They were joined by singles that failed to chart including 1958s Levi Jacket (And A Long Tail Shirt) and Pop, Let Me Have The Car; 1960s Honey, Cause I Love You and Just For You and L-O-V-E-V-I-L-L-E and Too Much For A Man To Understand; 1962s Twister Sister and Hambone and Hollywood City and The Fool I Used To Be and 1963s Forget Me (Next Time Around). Completing King Of Rock was This Life I Have, which covered the first five years of Carl Perkins’ career at Columbia Records. 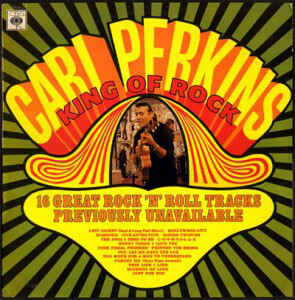 For fans of Carl Perkins, King Of Rock gave them an overview of his career between 1958 and 1963. It featured hits, hidden gems, B-Sides and the ones that got a way. King Of Rock showcases the considerable talents of the man who would later be crowned the King of Rockabilly. Just like Whole Lotta Shakin’, King Of Rock failed to chart upon its release in 1968. This was becoming a regular occurrence, with none of Carl Perkins albums reaching the charts. This changed in 1969. In 1969, the King of Rockabilly entered the studio to record what became Carl Perkins’ Greatest Hits. It found Carl Perkins re-record Blue Suede Shoes, Match Box, Mean Woman Blues, Turn Around, Folsom Prison Blues and Daddy Sang Bass. 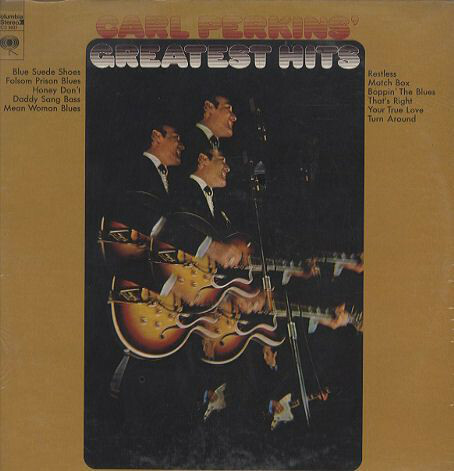 They joined Boppin’ The Blues, Honey Don’t, That’s Right, Your True Love and Restless on Carl Perkins’ Greatest Hits. When Carl Perkins’ Greatest Hits was released in 1969, it came with a forward from Johnny Cash, who grew up not far from Carl. The pair was so close that Johnny Cash says in the forward: “I consider him a brother.” He also encourages his ‘brother’: “to keep singin’ old songs that you know.” That was what Carl Perkins did on Carl Perkins’ Greatest Hits. He recorded ten familiar song, with some given a makeover, while Carl Perkins stayed true to the original on others. This resulted in an album found favour with critics and record buyers. Before the release of Carl Perkins’ Greatest Hits in 1969, Restless was released as a single and reached twenty on the US Billboard Country charts. This was Carl Perkins since Your True Love in 1957, which reached thirteen on the US Billboard Country charts. Things were looking up Carl Perkins. Upon the release of Carl Perkins’ Greatest Hits in 1969, the album reached thirty-two in the US Billboard Country charts. At last, one of Carl Perkins had charted. With the monkey was off his back, Carl Perkins began work on another new album. This was On Top, which found Carl Perkins cover an eclectic selection of songs. This ranged from blues-rock to country and soul, and included songs by Buddy Holly’s I’m Gonna Set My Foot Down and Brown Eyed Handsome Man; Ronnie Self’s A Lion In The Jungle; Jimmy Reed’s Baby, What You Want Me To Do? and Eddie Polo’s Riverboat Annie. They were joined by Champaign, Illinois which Bob Dylan and Carl Perkins wrote. Carl Perkins also wrote Soul Beat, Power Of My Soul and arranged C.C. Rider with Bill Denny. These ten songs became On Top. When On Top was released later in 1969, it was hailed as one of the best albums of the rock ’n’ roll revival. On Top featured some of the best material Carl Perkins had released in recent years. Among the highlights were the blues of Baby, What You Want Me to Do and the , rock ’n’ roll of C.C. Rider and Brown Eyed Handsome Man. They joined Champagne Illinois which was Carl’s collaboration with Bob Dylan, and two of the new compositions from Carl Perkins, Soul Beat and Power Of My Soul. 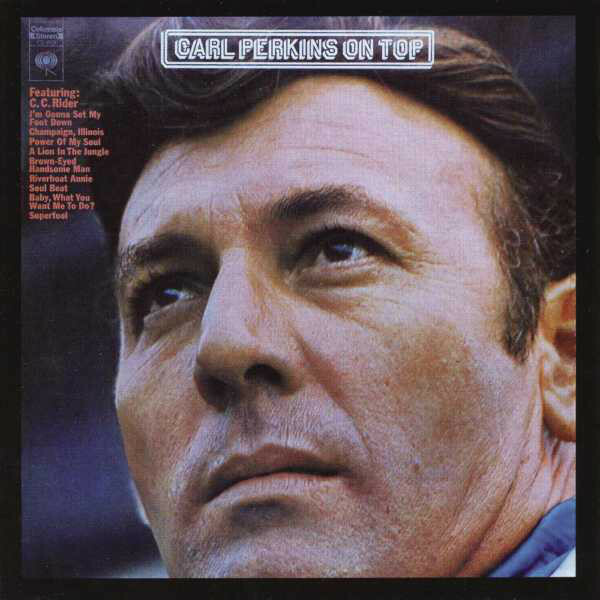 On Top was one of Carl Perkins’ strongest albums of recent years, and received praise and plaudits from critics. The King of Rockabilly’s comeback continued. On Top reached forty-two in the US Billboard Country charts later in 1969. This meant that Carl Perkins had enjoyed two successful album in 1969 already. Things got even better when Sun released Original Golden Hits and it reached forty-three in the US Billboard Country charts. Carl Perkins the King of Rockabilly, was now the comeback king. 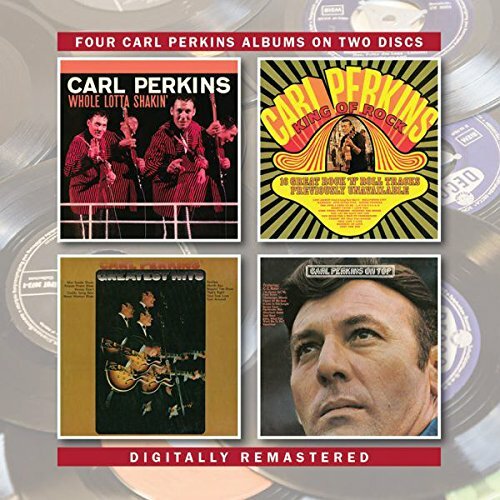 Two of the albums, that mark the comeback of Carl Perkins, Carl Perkins’ Greatest Hits and On Top feature on BGO Records’ recently released two CD set. It features 1958s Whole Lotta Shakin’, 1968s King Of Rock, and Greatest Hits and On Top which were both released in 1969. This quartet of albums feature some of the best music that Carl Perkins released during his Columbia Records’ years. During the Columbia Records’ years, Carl Perkins was still a popular draw in Britain and America. The King of Rockabilly had also influenced a generation of artists and bands, who had recorded Carl Perkins’ songs. Everyone from The Beatles, Elvis Presley, Johnny Cash, June Carter and Lee Hazelwood had covered Carl Perkins songs. These artists, especially The Beatles, championed Carl Perkins’ music and intruded it to new audience. They followed the career of the King of Rockabilly up until his death on January ’19th’ 1998. By then, Carl Perkins had won a Grammy Award and had been inducted into the Rock ’N’ Roll, Rockabilly, Memphis and Nashville Halls Of Fame. Carl Perkins had come a long way from when he first picked up a guitar in Tiptonville, Tennessee. This was how Carl Perkins escaped the poverty of his early years, and went on to live the American Dream. Nowadays, Carl Perkins is regarded as musical royalty, and one of the founding fathers of modern music. While he recorded some of his best known music during his three years Sun Records, Carl Perkins recorded some of his best and most underrated music during his Columbia Records’ years when he recorded Whole Lotta Shakin’, King Of Rock, Carl Perkins, Greatest Hits and On Top. Whole Lotta Shakin’, King Of Rock, Greatest Hits and On Top. ← MAGNETBAND-EXPERIMENTELLER ELEKTRONIK-UNDERGROUND DDR 1984-1989.